Subscribe to Australian Homespun magazine for 12 months & save 25% off! Even at first glance, with its delightfully textured look and feel, Homespun already has that crafty edge. Inside, it just gets better. Packed with inspirational ideas and fabulous projects all with easy-to-follow, step-by-step instructions and pullout patterns, this magazine is pure craft-heaven. Sewing, quilting, embroidery, patchwork, knitting, crochet, appliqué – there is something for everyone. Upcycle fabric leftovers, and breathe life in to small scraps and otherwise wasted remnants with clever ideas that demonstrate your creativity. Get busy on new and exciting projects from quilts, cushions and bags, to dolls, wall hangings and so much more. And of course, enjoy interviews with the many talented designers who contribute their design ideas each month and share their insights, tips and advice. AUSTRALIAN HOMESPUN MAGAZINE is the magazine for those who love all things craft. It’s Australia’s leading patchwork, appliqué, embroidery and stitchery title and is bursting with inspiring and informative projects on wallhangings, table runners, cushions, dolls, softies and much more.Featured projects are accompanied by step-by-step instructions, pull-out pattern sheets and easy-to-follow diagrams. Homespun will also keep you up to date on all the latest events in the craft industry and help you find out what new products are being launched. 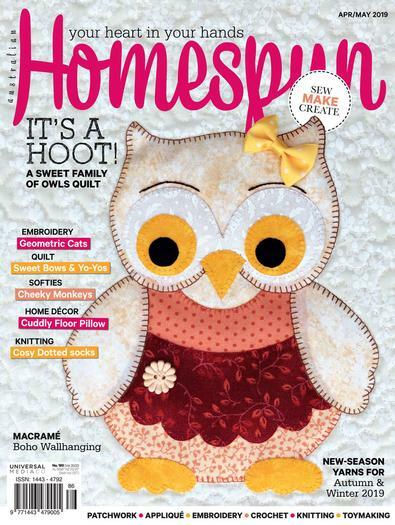 Australian Homespun is the quintessential crafter’s magazine. A superb knitting, sewing and hand crafts magazine. I love Mollie Makes but the subscription price is high and the products are UK based. I subscribed to Homespun instead and am sooo pleased! Homespun is beautifully written and photographed - and it&apos;s Australian made. You&apos;ll love it! Beautifully presented magazine. Gorgeous pictures and super quality thick pages. Modern inspiration at a dazzling price. love this magazine. This magazine provides so much useful information and great projects which keep me busy! I also love their great competitions. The Best!! Absolutely adorable...my favourite magazine..Love the projects and the beaut pics...Can&apos;t wait for the next issue!